I've been a knitting machine over the last week or so, considering that I just tried circular needles for the first time about 2 weeks ago. 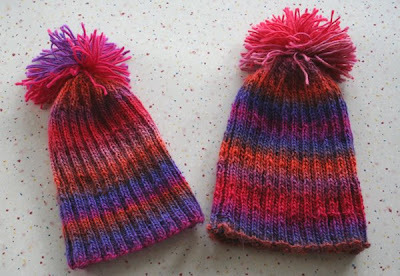 The final result of that experiment is below, with another matching hat for a friend. I know that knitting wool hats in the middle of summer seems odd, but I have grand plans for all the stuff I want to figure out before Christmas. I have to start somewhere! My stash is growing rapidly as I fall in love with new yarns and come up with new ideas for things I want to make for my family. On to my Work-In-Progress...I found some yummy, soft ecological wool yarn by Cascade Yarns at my local yarn shop only 2 days after I found the book, Knit Wit, at my local library. I fell in love with the striped yarn bag on the front cover of the book and decided to try my hand at something new--knitting and felting a bag. Instead of stripes, I'm just putting a blue trim at the top and making the rest of the bag in the twisted white/gray wool. I'll keep you posted as to how it turns out! Your knitting looks great! I've been wanting to get started on some Christmas gifts myself. 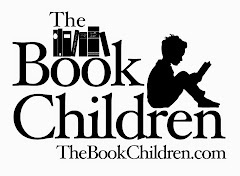 Better to start early than to run out of time &/or have a stressful holiday trying to finish. Wow, you did such a great job! They turned out beautiful. Joy! 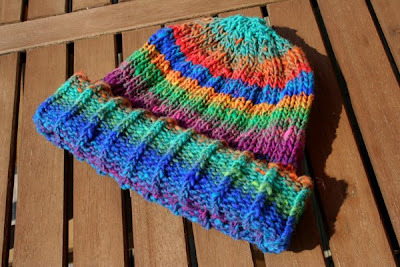 Your projects are gorgeous, love that yarn!! 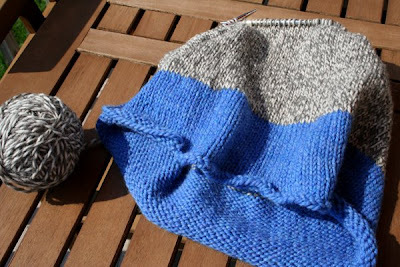 What an inspiring post, I have pretty basic knitting skills and keep wanting to learn more. I guess you just have to pick up the needles and get knitting! I think it is great you are starting Christmas gifts now, I never feel like knitting until it gets chilly and then it gets stressful when there is a time crunch! Kind of counter productive as knitting is such a relaxer! Gorgeous! The munchkins will be all ready for fall and stylish! I love those hats! They're beautiful - and look just amazing. You can never start on the winter projects early enough. 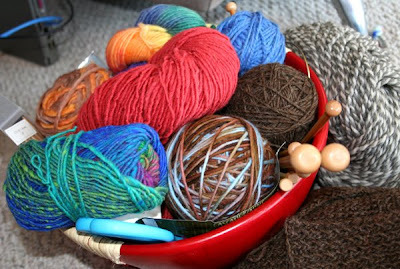 I love all of that yarn you have...I'm majorly jealous of that stash!!! You are doing a fabulous job on those circulars...they scared me for the longest time. You are making me want to pick up and knit the night away!!!!!!! !